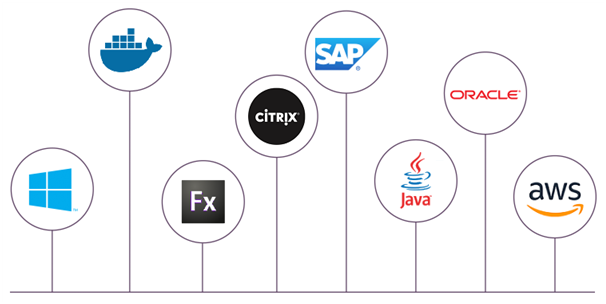 UFT centralizes and accelerates your end-to-end functional testing efforts across enterprise architectures with its support for nearly every major software application and environment, including SAP, Oracle, Salesforce, mainframes, embedded frameworks, headless browsers, and much more. Combine it with Micro Focus ALM to execute tests synchronously, or mimic user actions in UFT as the basis for performance tests in LoadRunner. Deploy UFT on provisioned Citrix, AWS, and Azure virtual environments, or run web and mobile tests from Docker containers. The possibilities are practically endless. UFT’s tight integration with Micro Focus’ on-demand test lab, StormRunner Functional, provides the elasticity to burst tests directly from its IDE into the cloud just as you would run locally, enabling you to test on a massive scale remotely against virtually any browser and device. Optionally, UFT also allows you to run tests in parallel on web browsers and on mobile devices using Mobile Center, thereby reducing complex testing processes and test execution time up to 80%. UFT fuels the combustion needed to drive sophisticated automated processes across distributed infrastructures. Mix-and-match recorded and scripted processes, and build assets through advanced visual-based identification that lets you “see” objects like humans do. Integrate UFT with Micro Focus’ industry-leading Operation Orchestration (OO) solution to easily design end-to-end workflows for unattended processes with out-of-the-box connectors for ServiceNow, Service Management Automation X (SMAX), and more—all designed to dramatically improve cycle time and increase productivity. Leverage a broad ecosystem of rich integrated tools and technologies for version control, CI/CD, and Micro Focus-based solutions. UFT works with open source and third-party CI/CD tools such as Jenkins, Bamboo, and Microsoft Team Foundation Server (TFS). Functional and regression tests can be triggered as part of the regular build process, run results reported in Micro Focus ALM, and teams instantly alerted to issues to keep the agile timeline on track. This means UFT facilitates collaboration among teams through its shared application object definitions, thereby keeping object-level changes synchronized throughout your test creation efforts. UFT gives you the ability to test at the headless layer without the need for extensive coding. Its multi-layered interface displays both UI and API tests in an intuitive graphical canvas, providing a clear representation of the test flow. Tests are clearly diagrammed in the canvas to illustrate critical information for automating complex application compositions and orchestrated business processes—all with corresponding actions, activities, and parameters to provide clarity of test logic and flow. Use it to create web, HTTP, and SOAP requests from a network capture file, import WADL documents to generate API tests, and more. UFT offers keyword-driven testing that simplifies test creation and maintenance. Capture flows directly from the application screens and leverage UFT’s robust record/replay capturing technology. UFT “power users” have full access to the underlying test and object properties through an integrated scripting and debugging environment that is synchronized with the keyword view. This includes time savers such as auto-completion of code, built-in and customizable code snippets, and additional tools for validation activities (file content, bitmap, array checkpoints, and more).